For this, use blue rods and I found that 4 was the optimum number for shooting. 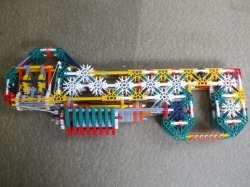 Please bear in mind that this is not my knex gun but I have made easy instructions as I know how difficult it can be to build a knex gun from other peoples instructions. I have also made a couple of changes. To build only the best knex guns, you should check out this website frequently for new tutorials, subscribe to my youtube channel, and ask any questions about anything to do with knex guns. I am more than happy to answer any questions.